Chocolate is my favorite food in the entire world. When I eat it, I understand the research that finds that chocolate causes our brains to release endorphins, the chemical that make us feel good. 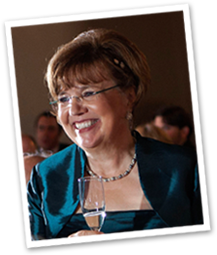 Since this is the month that we celebrate Valentine’s Day, I had to share one of my favorite chocolate recipes as well as the history behind it. When my daughter was studying in Florence, Italy, my husband and I went to visit her so that we could celebrate her 21st birthday. She took us to her favorite gelateria, Grom. Their gelato was truly amazing. When we heard that Grom opened in New York City, they became a go to place. On our first visit, we had the most decadent hot chocolate topped with a scoop of chocolate gelato. The juxtaposition of the thick hot chocolate with melting cold gelato was absolutely divine. It is perfection on a cold day! Needless to say, since we live three hours from New York City, I wanted to recreate this beverage to enjoy anytime. I hope you like it as much as we do. 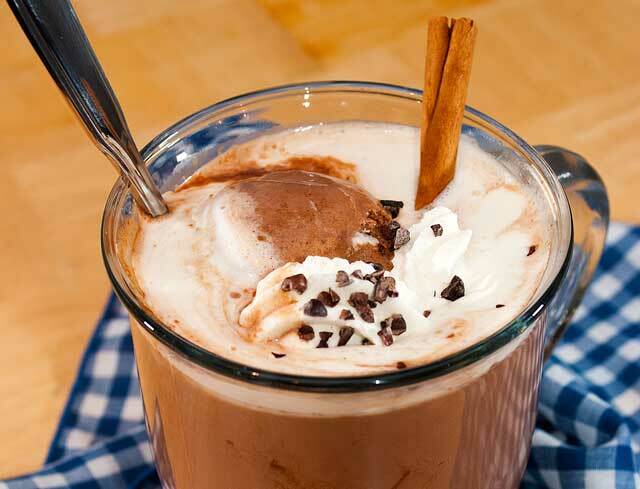 In the United States, we make hot cocoa with milk and cocoa powder or chocolate syrup. 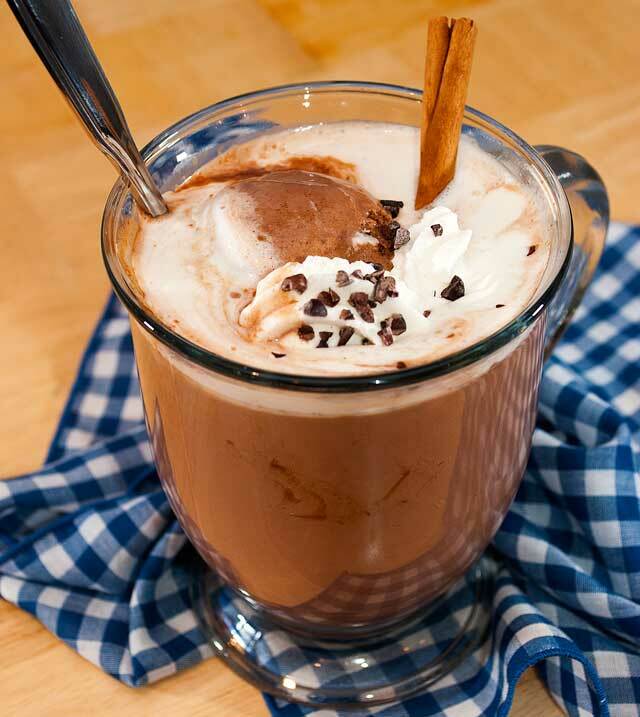 European hot chocolate is thick and rich. It is almost like drinking a melted chocolate bar. 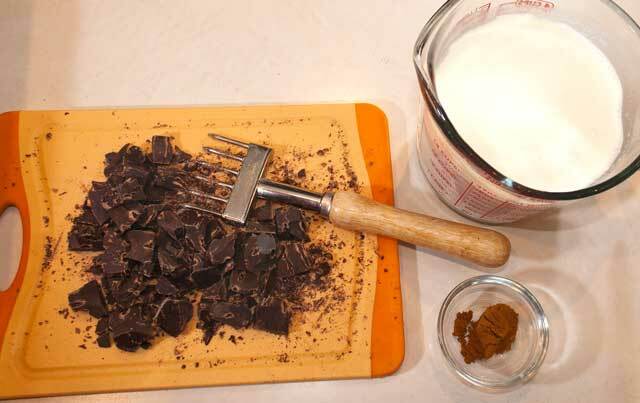 The ingredients for my re-creation include whole milk, heavy cream, chopped chocolate, cinnamon and cornstarch. Place the cornstarch, cinnamon, whole milk and heavy cream in a saucepan. Cook over medium high heat until the milk mixture starts to bubble. Continue stirring to lightly thicken the mixture. 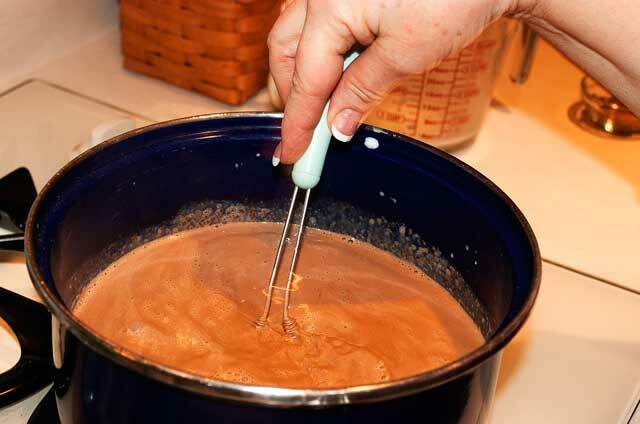 When slightly thickened, add the chopped chocolate and continue to stir until the chocolate is completely incorporated. Remove from the heat. 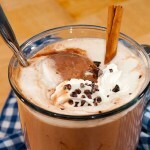 Pour into a cup and add a scoop of my Divine chocolate ice cream and a dollop of whipped cream. Put the whole milk, heavy cream, cinnamon and cornstarch in a medium saucepan. Cook over medium high heat until the milk mixture starts to bubble around the edges. Stir continually until slightly thickened. Reduce the heat to low and add the chopped chocolate. Stir until the chocolate is completely melted. The hot chocolate is the best ever!